As we make our way down the long and winding road that is a redesign, one of our goals has been making our academic pages easier to both navigate to and find information on once you’re there. I don’t think I’m speaking out of school when I say this University has struggled with this in the past. I really want clean pages with nice photography and the ability to get a quick overview of programs/majors, with the ability to learn more and dig deeper. We often try to cram as much information into a main academic area page as possible. I would like to do a better job at informing prospective students of the strengths of our academic programs. This is not just me being an Apple fanboy. 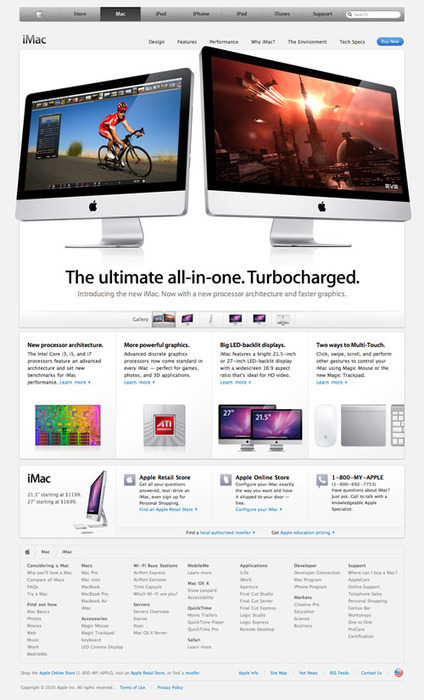 Apple has made their iMac page clean, compartmentalized and easy to get key points at a glance. They’ve used several photos of the actual product, the top marketing points and made it easy to buy. The HP page on the right was probably sent through a myriad of committees then through the marketing wringer. The best they came up with is a small image (in Flash no less) and 4 tabs of information, with the main one including 18 bullet points. 18. If I gave you the 10 second test with both of these pages, you’d be more apt to remember more points from Apple’s page. I would guess that many academic pages have “18 bullet points.” Maybe not bullet points, but a ton of information thrown on the index page because some felt it needed to be there. Mr. Mrgan also makes one other very good point. Which one do you think you (and your users) would be able to enter if they were looking for a specific program or area? Clean URLs are a very good thing. Many CMSes do an OK job at creating user-friendly URLs, but often I come across a college site with URLs like college.edu/29592.xml. That doesn’t help a user.